Brian De Palma's Carrie was so successful (it was a box-office hit and garnered Oscar nominations for its two female leads), he followed it up with yet another film dealing with telekinesis. The Fury was loosely based on a novel by John Farris, which he adapted for the screen. The budget of $5.5 million may not sound like much - but it was money very well spent. Peter Sandza (Kirk Douglas) and his son Robin (Andrew Stevens) are enjoying the day at a beach in the Middle East. Peter is a government agent about to retire and take Robin back to the States. The young man is apprehensive and says he doesn't think he'll fit in, referring to himself as a "freak." Peter tells him he has a talent that will "shock the hell out of people" and will be attending a school with others like him. Peter's friend and fellow agent Ben Childress (John Cassavetes) has recommended this school. The two men chat for a few minutes at a cafe and excuse Robin from the table. After saying farewell to each other and making a toast, Childress leaves to go find the boy. Suddenly, the beach is under siege by terrorists. Peter's waiter is shot dead while Peter himself takes a bullet in his hand. During the mayhem, Childress tries to shield Robin from danger. 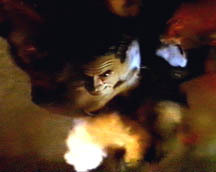 After one of the terrorists is killed, Peter manages to grab his machine gun and head towards a motor boat. Robin watches as his father is shot at and the boat explodes. What he doesn't see is that Peter jumped out just in time and has swum back to shore. Robin is taken away and Peter happens to catch a glimpse of his "friend" Childress thanking one of the terrorists for a job well done. Furious, he picks up a nearby gun and fires at them, wounding Childress in the arm. It turns out Childress doesn't work for the government after all. In Chicago a year later, Gillian Bellaver (Amy Irving) and her buddy LaRue (Melody Thomas Scott) are walking through a park and practicing for their upcoming finals. A strange man named Raymond Dunwoodie (William Finley) is following them. The guy's name pops into Gillian's head, despite the fact that she has never met him. Dunwoodie goes into a phonebooth and calls Peter to tell him he's found someone with psychic abilities who can help him locate his son. Childress and his people are tracing the call. They track Peter down to a cheap hotel and head out to apprehend him. When they arrive, Childress waits in the car while his men pay off the person at the front desk. They're told that Peter is registered under a pseudonym. However, Peter is ahead of them and escapes out the window...wearing only a pair of boxer shorts and shoes. He enters the apartment of a loud, obnoxious family called the Knuckells - and demands a few dollars and some clothing. Vivian (Jane Lambert) and Harry (Gordon Jump) are somewhat reluctant to help...but Mr. Knuckell's mother (played hilariously by Eleanor Merriam) takes to Peter and even fixes breakfast for him! Gillian and LaRue attend a demonstration in their school given by Dr. Ellen Lindstrom (Carol Eve Rossen), a representative of the Paragon Institute...that specializes in the study of telepathy. A Paragon employee named Hester (Carrie Snodress) is hooked up to a machine designed to make a toy train run by using biofeedback. The woman is not terribly successful. Gillian is asked to give it a try and shows extraordinary power. However, she has a vision of a bloodied corpse and is so upset, she makes the train go too fast and eventually off course. At lunch, Gillian is teased by Cheryl (Hilary Thompson). She dares her to read her mind in front of their friends (one of which is played by Daryl Hannah in her big screen debut). Gillian doesn't accept the challenge at first but Cheryl is insistent. Finally, Gillian makes a comment about Cheryl's pregnancy. It is obviously a secret Cheryl has been keeping and she's infuriated by this public revelation. She grabs Gillian and demands to know where she got her information. Suddenly, Cheryl begins bleeding profusely from her nose. The incident horrifies everyone and Gillian runs from the lunchroom. Peter has been with the Knuckell family all day. With Mother Knuckell's help, he applies shoe polish to his hair and pads his stomach before leaving in the evening. Dressed like an old man, he walks the streets and narrowly avoids being mugged. The disguise hasn't worked. He is being watched and Peter seems to sense this. He quickly hijacks an unmarked police vehicle driven by a cop named Bob (Dennis Franz) and his partner Marty (Michael O'Dwyer). He forces the nervous cops to drive down an alley, telling them that he used to work for a government agency that took his son away from him. With his pursuers still on his tail, Peter instructs Bob to pick up speed and drive into the fog. After a high speed chase, the other car goes off a ramp and explodes. Peter tells the officers to step out of their vehicle and drives it into the river. 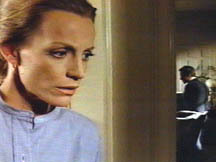 Gillian has a talk with her mother Katharine (Joyce Easton) and is disburbed because of what she did to Cheryl at school. Her mom tries to tell her that Cheryl has a history of nose bleeds...but Gillian isn't buying it and is even afraid for her mother to touch her. Katharine recommends she go to a shrink. Peter calls Hester (who happens to be his girlfriend) and she picks him up in her van. He wants to know if she's seen the files at the Paragon Institute and she admits that she has. She tells him that according to the records, Robin is dead. Peter knows this is not true. He says his son is alive because Childress is still anxious to put him away. He also tells Hester she's the only person who can help him get Robin back. The two park the van on a rooftop garage and spend the night there. The next morning, Hester vows to do what she can. In the meantime, Gillian has decided to check into Paragon because she says she likes Dr. Lindstrom. Her mother is against this idea but she gives in and drives Gillian to her new temporary home. 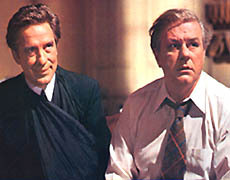 Dr. Lindstrom and Dr. Jim McKeever (Charles Durning), the Director, greet them. Gillian and Katharine are given a tour of the place and Dr. McKeever tells them that "telepathy is a timeless form of communication." The institute looks harmless and Katharine feels her daughter will be in good hands. She leaves her behind and heads to Paris for a trip. Gillian quickly settles in and takes a walk with Dr. McKeever. He tells her that she'll be trained to use a part of her mind to develop her gift and will become in tune with the "bioplasmic universe." He says she'll occasionally make a connection between the timeless world and the physical world. Although the doctor mentions her ability to have visions, Gillian says she never sees anything about herself. Hester quickly befriends the young girl. They have a good time together and even enjoy a riveting game of Pong. Later, while talking to Dr. McKeever...Gillian trips on the staircase and grabs a hold of his hand. She has a vision of Robin being chased up the stairs and falling out a window. 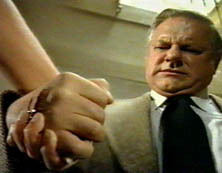 Gillian is so frightened, she doesn't let go of McKeever's hand...and presses it so hard she makes him bleed. She runs away and tells him not to touch her anymore. At a meeting with his staff, McKeever discusses Gillian's extraordinary power. He even tells the women employees not to be around the girl during their menstrual cycles. Dr. McKeever, Dr. Lindstrom and Hester visit Gillian in her room to ask questions about what she "saw" on the stairs. She tells them she could see a boy running and his name is Robin. Lindstrom and McKeever are taken aback and discuss what should be done. Dr. Lindstrom wants to keep Gillian around and do more tests - but Dr. McKeever doesn't want to be responsible for her. The two believe she's the best example of a person with telepathy since Robin...whom Dr. Lindstrom believes is dead. It appears that there has been a psychic connection between Robin and Gillian. "What happened to Robin?" Lindstrom wonders. The response she gets is that he did indeed fall through a window during a chase. Childress visits Dr. McKeever and asks about Gillian. His arm is dead from the bullets he received from Peter and is still in a sling. Hester overhears as he asks if the girl will be "another Robin." Robin is indeed alive and Childress tells him that the boy has no feelings for his father anymore. Dr. McKeever lies and says that Gillian is being sent home and has failed every test. Childress doesn't believe him and tells McKeever he's going to assign more security because he thinks Peter is somehow penetrating the institute. The next day, Gillian doesn't remember what happened. Dr. Lindstrom shows her photos of Robin and the girl has another vision. In this one, Robin is being forced to watch footage of the terrorist attack on his father. Gilian feels the same sensation as Robin and clutches the doctor's hand as Lindtrom asks where Peter is. Dr. Lindstrom begins bleeding from her fingernails, ears and eyes. She slumps over and falls onto a table. She doesn't die and is in stable condition, while Gillian is given a sedative. 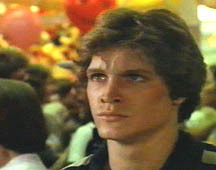 Childress says he wants the girl taken to the PSI Facility, where Robin is being held. Her mother is not to be told. Hester phones Peter and tells him Robin is alive. They meet at a mall and he tells her to sneak Gillian out of the institute before she's taken to another place. That night, Gillian enters Robin's old room. She has a vision of Robin talking with Dr. Susan Charles (Fiona Lewis), who he is apparently sleeping with. He tells her that he wants to leave Paragon. Dr. Charles talks him into going to the country with her. What she doesn't tell him is that he's actually going to PSI for more tests. Hester finds Gillian and fills her in on the plan. Gillian is excited about finally meeting Robin, whom she sees as the only other person she can relate to. Hester tells Gillian that she should only pretend to take her medication the next morning. Childress goes to PSI to check up on Robin. He's told that the boy is being given extremely strong drugs and is unstable. Dr. Charles says he flies into rages over nothing. She also tells Childress that Robin has developed a relationship with machines and he's trying to do the same thing now with his body. She plans to take Robin away so he can rest. Childress says she can only take him into the city for 24 hours. They go to a huge indoor carnival, where Robin sees Dr. Charles talking to two other employees of the institute. He gets jealous and wanders off by himself. Robin observes a group of Arabs on a ferriswheel...and remembering what happened to his father, he makes the ride spin faster and faster. One car breaks off and crashes into a nearby restaurant. Hester puts her plan into motion. As Gillian eats breakfast, she prepares to take the mail out to the post office. Hester opens the door and drops the mail on the floor. Gillians bends down to help her and then makes her escape. She runs out into the street, with Hester right behind her. A security car is in pursuit as well. Peter sits in a nearby car and takes aim. He shoots at the driver and makes the car lose control. Unfortunately, Hester runs right in front of it at that moment and is hit. Peter is devastated that he caused his girlfriend's death and goes over towards Gillian. 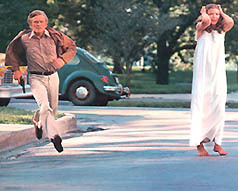 A nearby jogger sees the action and believes Peter is going to harm Gillian. They end up on a bus that night to take them to PSI. Peter is distraught over Hester's death and he and Gillian quickly develop a bond. They talk about Robin...and Gillian tells Peter that his son is okay. The two arrive at their destination the next morning. Peter insists that Gillian stay on the bus and head on to Seattle, but she tearfully refuses to. By nightfall, they have made it to the estate where Robin is living. He's inside preparing for a small dinner party with Dr. Charles and Childress. For a moment, Robin and Gillian share a connection and sense each other's presence. Robin has been agitated all evening. He tells Dr. Charles that he knows Gillian is coming and that he'll be replaced by her. The doctor denies this and Robin reacts by making her ears bleed. She falls onto the floor and Gillian yells out "he's killing her!" Her screams set off the security system and both she and Peter are apprehended. Robin's psychotic rage worsens and he telepathically lifts Dr. Charles into the air and spins her around, making her blood splatter all over the walls. Peter is taken inside to Childress. He demands to know where his son is but Childress just scoffs. Peter lunges at him and at that moment, there's another commotion in the house. Two security people enter Robin's room - only to be tossed out the window. Childress then allows Peter to go find Robin. He sees the room covered in blood and Dr. Charles' body on the floor. Robin is levitating above him. Peter asks him if he recognizes his old man, but the boy has been so brainwashed...he's practically a different person. He attacks Peter and they both end up flying out the window. Peter manages to stay on the ledge, with Robin hanging over the side holding onto his hand for his life. But he doesn't see Peter as his father anymore and tries to scratch his face. Finally, Peter lets go and Robin falls to the ground. Gillian screams and runs over to cradle him in her arms. Before he dies, Robin transfers his power over to the girl he had never met but felt a strong connection to. Peter is so distraught, he jumps to his death. "Get them out of my sight," Childress tells his men. Gillian is now held captive by Childress. She wakes up in the morning to find him in her room pretending to be sympathetic. He tells her not to judge him harshly by his actions and asks that she put all the tragedies behind her. "All I want is for you to trust me," he says. Sitting on Gillian's bed, he puts her head on his shoulder as she cries. Suddenly, she kisses him on his eye and backs away from him. Blood begins pouring from his sockets and he goes blind. "You go to hell," Gillian tell him as she puts all her force into making Childress shake violently. Then, in the greatest act of retribution you ever did see, she makes him explode. It's an unforgettable ending in which we see this sequence from THIRTEEN different angles! Alternately ripping off Hitchcock and his own work from Carrie, Brian De Palma still manages a riveting piece here...from the tortured characters of Andrew Stevens and Amy Irving - to the hapless Kirk Douglas - to the archvillain John Cassavetes. Fragile beauty Irving, who had played Sue Snell in De Palma's previous feature, is excellent. Stevens is surprisingly intense. After the release of Carrie, the director revealed that he believed it could have been a bigger blockbuster in the tradition of The Omen and The Exorcist if it had starred a more established name such as Gregory Peck or Ellen Burstyn. 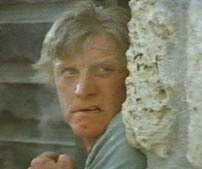 For that reason, he cast Kirk Douglas in The Fury. Douglas had been a star since his debut in The Strange Love of Martha Ivers in 1946, some thirty-two years before. The exceptional special make-up effects were courtesy of Rick Baker, who along with Tom Savini, must surely rank with the greats in that field. In a departure from his usual collaborations with Pino Donaggio, De Palma had John Williams compose the stirring score. 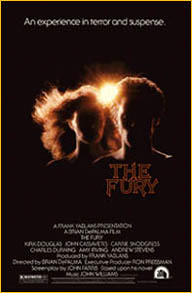 The Fury approaches powerful proportions and deserves its place as a thriller classic.